Documentary series Citizen Mars tells the stories of five Mars One candidates. Produced for Engadget, AOL’s technology site, the series benefits from the parent company’s marketing campaign. AOL news site, The Huffington Post, promotes Citizen Mars with a series of candidate posts. Mohammed Sallam and Adriana Marais wrote pieces last week. Cinema Blend reviewed the documentary, calling Citizen Mars "a quick and compelling watch”. Following her appearance in Citizen Mars, Sue Ann Pien spoke about her travels and sense of adventure with men’s site CheatSheet. “One Giant Leap”, a short documentary about Mars One candidates Dianne McGrath and David Mould will screen at the Melbourne Fringe Festival. How to Live on Earth follows four people selected for a one-way mission to Mars. Inspired by Mars One, the play examines the impact their decisions have on family, friends, and themselves. How to Live on Earth opens in New York September 17 and runs through October 3. Dutch scientists have successfully grown crops in simulated Martian regolith, reports Volkskrant. Wieger Wamelink had previously documented his group's progress on the Mars One Community blog. Team Gamma's concept explores the use of "distributed functionality" among it multi-robot mining and construction system. Team Moa Architecture's concept algorithmically adapts the habitat's design to fit within the local environment. Team Red Works took inspiration from ancient pueblos and pit houses (think Luke's home on Tatooine) to create a buried architecture. Team Search/Clouds Architecture Office creates a light-filled environment by printing the habitat's structure with ice. 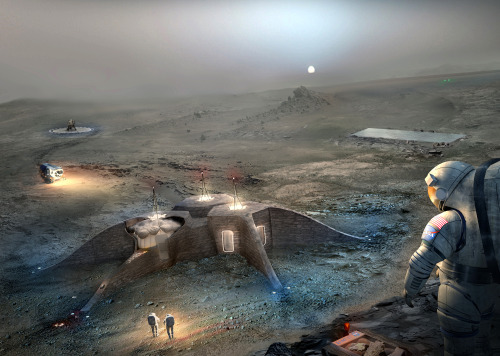 Nasa unveiled the finalists of its 3D Printed Habitat Challenge. The rocket equation imposes both physical and financial limits on deep space exploration. The less mass that must travel from Earth, the lower the cost of the overall mission. 3D printing and other additive manufacturing techniques could lower those costs by letting astronauts use Martian resources. Makers, architects, designers, and engineers around the world responded to a call from Nasa for conceptual habitats that could be printed on Mars. Nasa’s Maven mission team completed its fourth deep-dip campaign. The spacecraft descended to within 125 kilometers of the planet’s surface where the atmosphere is 30 times denser than at Maven’s normal 150-kilometer orbit. The deep-dip campaigns let scientists study the well-mixed layers of Mars’ upper atmosphere directly. The European Space Agency released a mosaic of the Martian south pole taken by its Mars Express orbiter. Nasa’s Mars Science Laboratory mission team released a panorama of petrified Martian sand dunes captured by the Curiosity rover’s Mastcam. The Planetary Society’s Van Kaye wrote about Icebreaker, a proposal to search for life beneath the Martian north pole. Planetary scientist Tanya Harrison’s article on The Planetary Society’s blog explains how to process images from the Mars Reconnaissance Orbiter’s Context Camera.